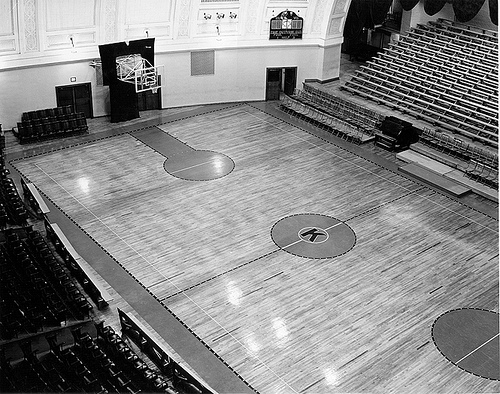 Hoch Auditorium became home to Jayhawk basketball when the team abandoned old Robinson Gymnasium. 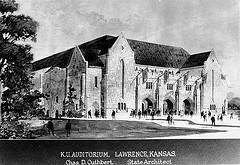 By 1925, the University of Kansas was beginning to outgrow old Robinson Gymnasium, which had been built less than 20 years earlier. Due to rising enrollments and the popularity of KU basketball, overflow crowds were taxing the facility’s capacities, presenting a clear and present fire danger that University administrators could not long ignore. In 1927, KU secured upwards of $300,000 to erect Robinson’s larger (and presumably safer) replacement, Hoch Auditorium, which was named in honor of Edward W. Hoch, a former Kansas governor and regent as well as a long-time supporter of the University. Ironically, this very structure built to lessen, if not eliminate, the risk of fire, was consumed and ruined by a lightning-induced fire on June 15, 1991. It is a small wonder, though, that fiery disaster did not strike Hoch sooner. Nine months before its October 1927 dedication, the state’s fire inspector responded to inquiries about the building’s safety. Not to worry, he said, for although Hoch’s supporting arches were made of wood, the ceiling’s height profoundly diminished the risk that a floor fire would threaten the entire structure. That settled, three years later, fearing a heavy snowfall would collapse the roof, contractors reinforced it with additional heavy wooden beams – perfect kindling in the event of a fire. Yet he added, frankly, “It’s very old and would take considerable expense to get back in line with present standards.” Considering that the University of Kansas engaged in annual battles with State Legislature for money to erect much-needed new buildings, it is not surprising that the costly repair and refurbishment of an old one was not a high priority. During its 64-year history, as the Topeka Capital-Journal once noted, Hoch Auditorium was “a favorite target of lightning.” And according to an article in the March 1992 edition of Kansas Engineer, “When the KU Police Department offices were housed in the building, they would move their vehicles as storms rolled in to Lawrence. Lightning would often hit Hoch, causing roof material to slide off the roof and down onto the cars below.” Inconceivably, no one had ever thought it necessary to install rooftop lightning rods until mid-1991. Indeed, that very summer, plans called for the restoration of Hoch’s wood-shingled roof including the addition of lightning rods for the first time. But until the work began, Hoch lay prone and unprotected. It was easy prey for a 53,000-degree lightning bolt that split and seared its roof on June 15, 1991, just days before the start of the scheduled improvements. By 7 p.m., over 70 firefighters from Lawrence and such nearby cities as Lenexa, Overland Park, and Shawnee were finally able to contain the fire, but not before it had collapsed the roof, gutted the entire structure, and left little more than charred, smoking remains. “It was a total loss,” said KU police Lt. John Mullens. In a little under four hours, one of KU’s oldest and most revered buildings – one of six on campus listed in the National Register of Historic Places – was gone. Notwithstanding the estimated $13 million in material damage, the fire destroyed irreplaceable archival materials belonging to the University’s FM radio station, KANU, and displaced thousands of students and faculty scheduled to attend or teach fall semester classes in Hoch. As it turned out, though, the Hoch ruins did not become a permanent feature of Mount Oread. On May 22, 1992, an unexpected “federal windfall” enabled Governor Finney and the State Legislature to enact legislation that provided a total of $18 million over three years for the complete rebuilding of Hoch Auditorium. By most contemporary accounts, securing such a large sum would have been impossible without the indefatigable efforts of Chancellor Budig. According to Kansas Alumni, for months Budig “lobbied endlessly for funds, speaking in terms of Hoch’s history and its importance to meeting the scholarly mission of the University.” In honor of his work, the State Board of Regents named the rebuilt structure Budig Hall, but retained “Hoch Auditoria” on the façade and as the collective name for the building’s three new lecture halls. When guests arrived for Budig Hall’s official dedication on October 31, 1997, KU Chancellor Robert Hemenway welcomed them to an entirely different facility, one that employed state-of-the-art educational and multimedia technology. 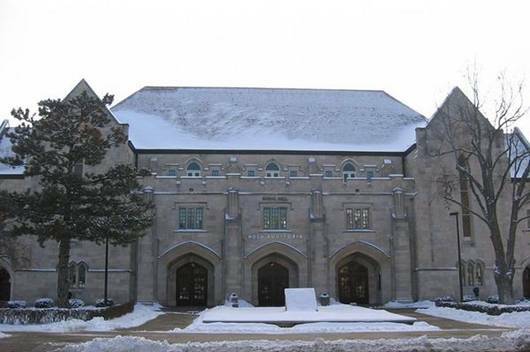 According to the KU News Bureau, Budig Hall contained “one 1,000-seat and two 500-seat lecture halls, or auditoria. Each is equipped with three 10-by-14-foot video screens, upon which images from a variety of sources, such as the Internet, video or film, satellite link, laserdisc and 35 mm slide, can be projected.” And for science experiments, each room had “a covered floor trench [that] provides water, electricity, compressed air and drainage.” In addition to two underground floors devoted to library holdings, students could use Budig’s new 125-station computer laboratory and attend classes in, what was now, the University’s largest classroom structure. One could not but be impressed by the building’s high-tech, “Star Wars” interior, as the Topeka Capital-Journal described it. The University’s assistant provost, Richard Givens, told the paper “KU is one of the only universities in the country to have a facility like Budig Hall. Other schools also use the latest technology, but not to KU’s extent.” Back in August, the Kansan had reported that “the first days of classes” in Budig “left students and faculty in awe.” But the building’s exterior was equally remarkable, particularly because the architects were able to preserve Hoch’s gothic, limestone façade while incorporating flying-buttress-like glass atria on the east and west sides. It was a pleasing fusion of disparate architectural styles. In his dedicatory address, Chancellor Hemenway described Budig Hall as “a modern day phoenix rising from the ashes” and went on the express the University’s appreciation for its namesake’s efforts. After serving as chancellor for 13 years, Gene Budig left KU in 1994 to become the commissioner of baseball’s American League. However, he happily returned to Lawrence to celebrate the opening of Budig Hall, bringing with him some of the sports world’s biggest names, including New York Yankees owner George Steinbrenner, Chicago Bulls and Chicago White Sox owner Jerry Reinsdorf, and Kansas City Royals legend George Brett, among others. There is no indication that Budig brought it up in his remarks, but construction of the Hall had taken two years longer than originally anticipated and had cost, not $18 million, but $23 million. As the Capital-Journal reported, however, much of the delay and increased expense could be traced back to the fact that, “fireproofing in the ceiling wasn’t thick enough … and replacing it [had] set construction back.” Given the building’s history, this extra last-minute effort was probably time (and money) well spent. The views and interpretations expressed in this article are those of the author and may not necessarily reflect the official position of the University of Kansas.